Samsung Mobiles has officially launched its new smartphone named Galaxy Grand Quattro in India. This is yet another phone in Galaxy Grand series and now available on Samsung India e-Store. The phone comes with a 4.7 inch TFT display with the resolution of 800x480 pixels. 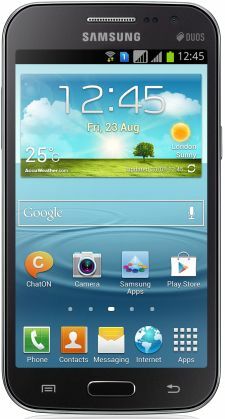 It runs on Android 4.1 Jelly Bean operating system and powered by 1.2 GHz Cortex A5 quad-core processor with 1 GB of RAM. Galaxy Quattro features a 5 MP rear camera with auto focus and LED flash options and there is also a 0.3 MP front facing camera. The phone has 8 GB of internal memory and the external memory can be expandable up to 32 GB via microSD card. It equipped with a 2000 mAh battery that gives 11 hours of talk time. Galaxy Quattro has the connectivity options are 3G, Wi-Fi, GPS and Bluetooth. The phone has dual sim support with dual standby mode and dual Sim always on features. Samsung Galaxy Grand Quattro comes in Black and White colors and it is priced for Rs. 17920. But now the price is reduced at Rs. 16900 on Samsung India e-Store. The phone is now available on all retail stores and online retailers also.